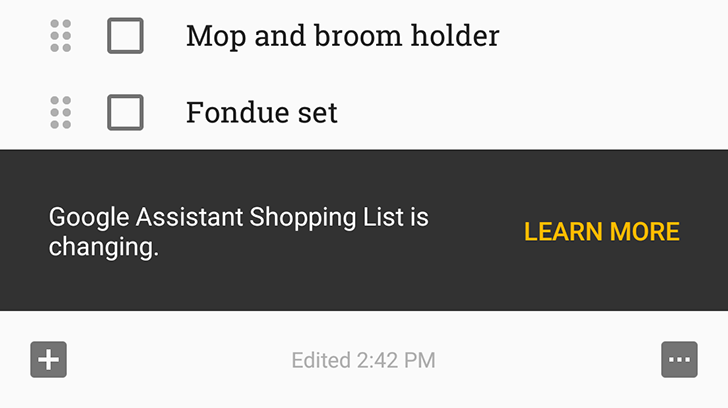 I love having the Google Assistant shopping list in Keep. It means that I can access it whenever I want on the phone and the web, add items to it, and share it with my fiancé while we're in the process of furnishing our apartment. It also means that we don't have to worry about using another app: everything we need is organized in Keep and so is our shopping list. But that's about to change soon, very soon, like this-Monday soon. A new notice is showing up for users when they open up their Google Assistant Shopping List in Keep telling them that changes are afoot. According to the support page, the shopping list is becoming an integral part of the Google Home app. This is where all the items you add from Google Assistant, Google Home (the device), and Google Express will end up. It will show up on the left slide-out menu of the Home app as "Shopping List." If you don't want your items to move anywhere, Google explains that you can still copy the note in Keep now to continue using it there. But any items you add via Assistant won't show up in it: the duplicate will become a manual entry list like any other list in Keep. The move reminds me of what Amazon does with Alexa's shopping lists. They're nestled inside the main app and handled there. But Google already has a powerful list and note app, so why it decided to move away from it baffles me a little. Artem and Cody both seem to think that the use of Keep was a momentary hack and a more powerful solution was bound to be released at some point. I tend to disagree. There are still three questions left unanswered with this move. One is whether users without a Google Home (the device) and outside of the USA will see the Shopping List in the app's menu. So far, plenty of options from Assistant have been hidden from those who don't own a Home device, so would this be one of them? I'd like to think that it won't be the case, but who knows?! Two is whether users who don't have Google Express will have any way to access the list from the web. And three is how shared lists will be managed. Keep wasn't an elegant solution for couples and households with multiple users. Adding items with Assistant only worked for the person who created and shared the list, but others had to type them manually in Keep because adding with voice would send items to their own personal list. The support document says, "Your list will automatically be shared with anyone you shared your Keep list with. They can access their lists from the Google Home or Express app," which infers that multiple lists will be supported but doesn't say if users would be able to add items to someone else's list with a voice command. I guess it's only 2 days until we have answers to our questions so until then, maybe do the wise thing and duplicate your Keep shopping list... just in case.